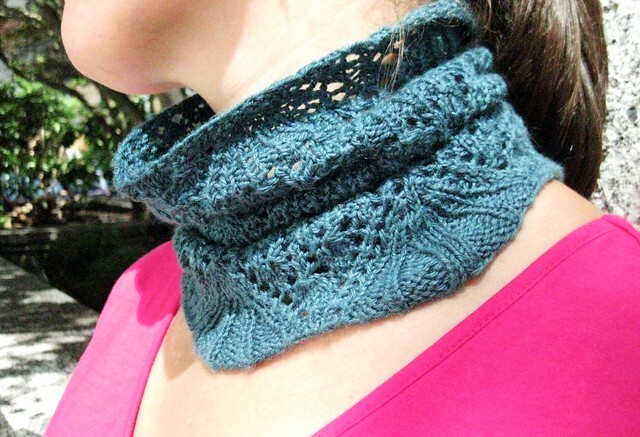 Summer can be a bit of a lull time for most knitters as its so warm & humid that the idea of working with yarn (especially wool or animal fibre yarns) seems like an obtuse idea. No so for me, as I find ways around the heat by knitting smaller, lacier, somewhat “instant gratification” type projects. My co-worker Dayna has often admired my craftiness and had expressed interested previously in having me make something for her, with the proviso that it not interfere with any other knitting-related deadlines that I may have. Sweet of her, huh? I showed her a cowl pattern that I’ve had in my queue for forever (no really, its been in my queue since 2008!) that I wanted to knit and was she interested? Hells yes! Away we went with the pattern in hand to the LYS Wool is Not Enough where Dayna bought some gorgeous Twisted Sisters Oracle yarn in Agave. This yarn is a delicious blend of 60% merino wool and 40% bamboo. The yarn has that lovely sheen that only comes with bamboo, and it behaved more like a plant-fibre base rather than an animal-fibre base yarn (namely, that it didn’t have a lot of give when knitting it up). We bought 2 skeins (= 420 yards stash-in) because the cowl looked like it would eat up more than what the pattern called for. I suggested to Dayna that I make her a matching pair of mitts because hey, what makes a lady ready for autumn winds and temperatures? 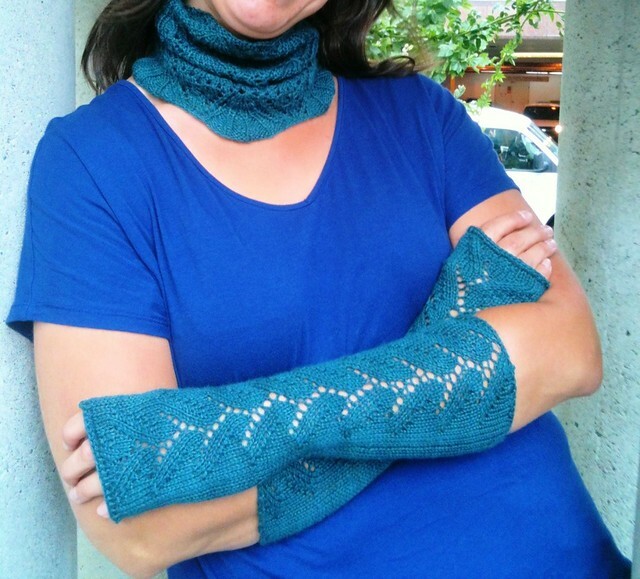 A smart, matching set of mitts & a cowl, that’s what! Needles: 3.75mm 16″ circular and 3.5mm 16″ circular needles (pattern also called for 4mm to cast-on, but I didn’t like the baggy look of the cast-on edge when I initially started the cowl so I dropped down to the 3.75mm to cast-on instead). Pattern repeat 5, rows 7, 9, and 11, I decreased on the inside & outside wrist (either K2tog or SSK like doing the toe of a sock) as this pattern has no shaping in it at all. Row 1: increase on both inside/outside wrist by either M1R or M1L as appropriate. All thumb gusset increases were M1R or M1L rather than Kfb as I don’t like the look of those increases. I also picked up 6 rather than 5 stitches after putting the 15 sts on waste yarn to help close the gap. I picked up 12 rather than 8 sts to help close the gap and divided the stitches amongst 3 needles. I also wanted to make these mitts look a bit more finished as they didn’t have any ribbing around either cuffs. So I did SC around the arm cuff, and did an applied i-cord bind-off around the finger cuffs. Dayna is officially (at least in my books) a woman about town. You are currently reading A woman about town… at When Gaia Smiles.